There is a lot of sweet buzz going on about agave nectar. If you haven't tried it yet, I hope you will after reading some facts about this natural sweetener and its benefits to your health. The benefits don't stop at natural sweetening. Research indicates that it's benefits may reach far beyond the obvious, including wound healing, weight loss, and overall health. Let's take a look at what the buzz is all about. Agave nectar (also called agave syrup) is a sweetener derived from several species of agave plants grown primarily in Mexico. It is similar in consistency to honey. It's big claim to fame is that it has a low-glycemic index, but what does that mean? Basically, it means that when consumed, agave won't cause a sharp rise or fall in blood sugar. To give you an idea of what all this means, check out this quick reference list of common sweeteners and their corresponding glycemic values. Keep in mind, the higher the value, the bigger the impact on blood sugar. 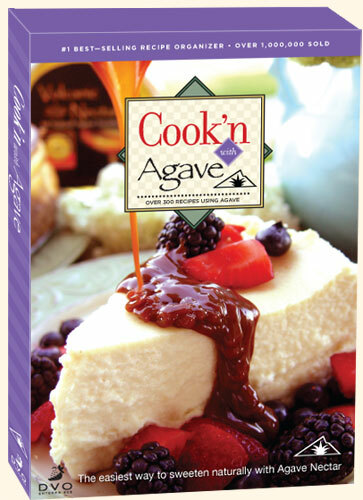 Try it yourself with our own Cook'n with Agave! While most of us don't think much about the glycemic index it can be a real life-saver to those with diabetes. Learning to sweeten foods without the extreme impact on blood sugar can literally be life changing. If you are diabetic and monitor your food exchanges, a one-teaspoon serving of agave nectar equals a "free food." Two servings or two teaspoons equals 1/2 carbohydrate exchange. Replace sugar with agave The benefits of using agave to sweeten certainly aren't limited to those with diabetes. This change could have huge health impacts for people of any health level. Who doesn't want deliciously sweet food that send the blood sugar soaring out of control? Not All Agave's are Created Equal After doing a bit of research, we've discovered not all agaves in the market are the same. Turns out, some are filled with what seems to be high fructose corn syrup, sucrose and other man made fillers. Yuck! Luckily we've done the research through independent laboratories so you know what you are getting and that it's truly good for you. Don't just take our word for it... Click here to see for yourself! Use about 1/3 cup of agave nectar for every one cup of sugar called for in recipes. Reduce the liquid ingredients in recipes by one-third, since agave nectar is liquid (and sugar is dry). Reduce your oven temperature by 25 degrees. Agave contains saponins and fructans. According to Dr. Ray Sahelian, saponins, have anti-inflammatory and immune system-boosting properties, including antimicrobial capability. In fact, the Aztecs used agave syrup to treat wounds because of its antibacterial properties. Inulin is a type of fructan or fiber that has many health benefits. Studies suggest that inulin can be effective in weight loss because of its low impact on blood sugar and its ability to increase satiety and decrease appetite. Inulin is also associated with lowering cholesterol, reducing the risk of certain cancers, and increasing the absorption of nutrients. That may be a mouthful of medical jargon, but certainly tells us that agave offers some fantastic benefits for healthy living, far beyond those of many other sweeteners! Ready to put all the buzz to the test? Try these recipes to see for yourself! Combine agave, soy sauce, chili sauce, garlic salt, pepper and hot pepper sauce. Arrange chicken in single layer in a 9 x 13-inch baking pan and pour on sauce. Turn chicken over to coat with sauce. Bake at 350 F for one hour, turning over once. Cool slightly and serve. Serves 8. Dissolve yeast in 1/2 cup warm water. Stir in whole wheat flour, 1 3/4 cups warm water, carrots, bananas, butter, agave, salt and cinnamon beat until smooth using an electric mixer. Mix in enough flour to make a soft dough. Knead about 10 minutes, or until smooth and elastic, on a lightly floured board. Place in a large greased bowl and turn to grease all sides. Cover bowl and set in warm place to rise about 1 hour or until doubled in size. Punch down dough, divide in half, flatten each half with a rolling pin, or your hand, to 18 x 9-inches overlap the two sides and fold into thirds. Roll each half up tightly and place in two greased 9 x 5 x 3-inch pans. Brush tops with melted butter. Let rise about one hour or until doubled in size. Bake at 375 F for 40 to 45 minutes or until crust is brown. Remove from pans and cool on wire racks. In top of double boiler, combine egg whites, salt and orange juice. Beat mixture until egg whites hold their shape in soft peaks. Continue beating while adding agave in a fine stream. Cook over boiling water, beating constantly for 5 minutes until mixture forms stiff peaks when beater is raised. Remove from heat. Add vanilla and beat frosting 2 minutes longer until frosting is of spreading consistency. Makes 1 cup, enough to frost 2 8-inch cake layers. Makes 13 servings.